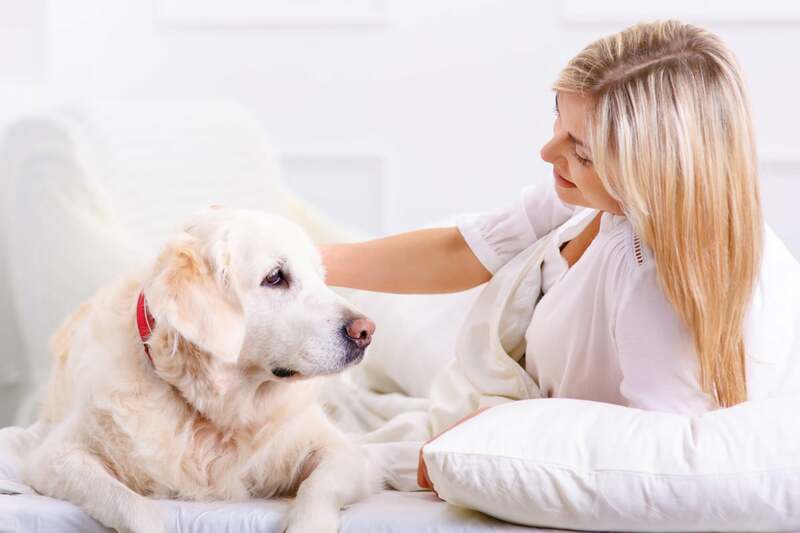 Joint pain is a very common problem for a lot of dogs and can have multiple different causes, almost none of which are harmless or ignorable. Generally, senior dogs are more prone to joint pains. However, large breeds have been observed in studies to be far more likely to develop joint related problems than medium or small dogs, since size and weight are key factors in any joint-related problem. This doesn’t mean that a medium-sized or even a small dog can’t have joint problems, however. Being overweight, going through a physical trauma or getting another disease that can cause joint problems – these things can all lead to joint pain even in smaller breeds. You should also keep in mind that there are breed-specific joint problems that occur quite often in some breeds and very rarely in others. Keeping an eye on those problems can help one to adequately read the signs of joint pain and to react promptly. For example, Newfoundland dogs have an increased risk of cruciate ligament disease, higher than all other dog breeds. Rottweilers are very prone to knee and ankle problems. Bernese Mountain dogs are at a higher risk to get elbow dysplasia. Problems getting on and off the couch. We might be used to our dogs jumping from and to the furniture, which, especially for bigger breeds, can seem especially easy. However, joint problems can make even this effort painful and uncomfortable for your dog. So, while you shouldn’t freak out every time your Rottweiler gets off the couch a bit more clumsily, if you notice a distinctive pattern change of the way your dog climbs on and off the couch – this is noteworthy. Troubles with stairs. Going up and down the stairs is another everyday activity that isn’t supposed to trouble your dog but can turn into a nightmare if joint problems are present. They run less. When our dogs start running and playing less we usually attribute this to them getting older and losing interest in the games and the exercise. And while this is often the case, a part of “getting older” is often joint pain. If your dog has lost a significant interest in running with your, consider the possibility of a sudden joint pain. No desire for fetch or other outdoor games. The same goes for all outdoor activities and games that your dog has usually loved. It’s not abnormal for a dog to lose interest in a game as he gets older, but drastically stopping all physical activities is a surefire sign of joint troubles. Sitting and sleeping in unusual positions. Joint pain can make even just sleeping and sitting a painful exercise, regardless of whether it’s on the floor or on the furniture. If your dog starts to regularly sleep in unusual positions, joint pain might be involved. Irritability. Just like us, dogs can easily get irritable when they have a significant physical discomfort. Especially if we are not aware of that and try to play with them, touch their painful places, etc. Of course, irritability can be a sign of a lot of other physical ailments, as well as of a lot of non-physical problems, but joint pain is high on the list, especially for breeds with high risks of joint problems. Depression. Irritability can easily grow into depression when the problem persists and that’s not uncommon since a lot of dog owners fail to notice the previous signs in time. With depression come a loss of appetite, sleeping disorders and a lot of other behavioral issues that are less easy to miss, however, depression can also be caused by a lot of other problems and not just joint pain. Spinal issues such as sore neck, a hunch in the back, etc. Remember that joint problems don’t necessarily mean just the joints in the legs. Your dog can also have spinal problems, which can be seen in a sore neck or as a hunch in the back of the dog. Lameness. As the condition progresses, so will the symptoms. Lameness is a problem that you should never see in your indoors pet since you should have noticed the problem before that. When the joint paint becomes even stronger the dog will keep his painful foot/feet lifted and will avoid stepping on them altogether. Limping. Occurring together with lameness, limping is another guaranteed sign of joint troubles. Whimpering in pain. Hopefully, your dog’s joint pain will never reach a stage where the animal is actively whimpering in pain, but this is what happens when the pain becomes unbearable. If your pet is whining out of pain, get him to a veterinarian as soon as possible. Joint troubles are unfortunately not one of those problems that we can easily expect to pass us by. Especially in bigger or more active breeds, joint troubles are frequently seen. 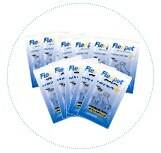 To make sure that your dog has as little of a risk of joint issues as possible, feed your pet an appropriate and well-balanced diet, utilize joint supplements for those dogs at higher risk or showing early signs of joint pain (here’s a special offer exclusively for first time customers of Flexpet) arrange good sleeping and living conditions (many dog owners have had a lot of success with an orthopedic dog bed), ensure proper room temperature, and do regular veterinary check-ups at least twice per year. Prevention is always cheaper, less painful and less dangerous than reactive treatment. I wish I’d known this sooner… I used to have a dog who I remember we noticed had become a lot more irritable than she was before and seemed to be lying around more than usual. We weren’t really sure what was wrong, and it ended up lasting so long that we took her to the vet and it turned out she was developing arthritis. It made me sad to know she’d been living with pain like that for so long but we didn’t even realize it.